The Alabama Gulf Coast has more than its share of championship golf in Gulf Shores, and a stay at The Beach Club Resort & Spa puts visitors right smack in the middle of great golf opportunities. Why not plan to tee off for an epic golf getaway for your next Gulf Shores vacation? Here’s the scoop. Gulf Shores is perfectly suited for the golfer in the group with an impressive sub-tropical climate that supports year-round play, lots of facilities to practice, PGA pros on hand for lessons and, of course, spectacular beach views like no other. From the beginning golfer to the seasoned player, there are plenty of options for a nearby golf resort when staying at The Beach Club. Warning: you’ll be hooked on these fantastic courses when you see the course strength coupled with their impressive views. But, first, practice your swing before hitting the greens at The Village Hideaway’s HD golf simulator. Get a grip on your game while the kids enjoy the arcade. You can even order lunch from the grill afterward. Craft beers are always on tap and multiple televisions line the walls. The award-winning Kiva Dunes Golf Club is less than five minutes from The Beach Club and is stunning in both design and setting. Located beachside along the Fort Morgan Peninsula of Gulf Shores, Kiva Dunes is Alabama’s number one ranked golf resort. The latest renovation was completed in 2015 on the championship course developed by Jim Edgemon and U.S. Open champion Jerry Pate making it more playable for average golfers. Need a lesson? No problem! Rea Schuessler is the resident PGA instructor with more than 25 years of experience. Also, golfers can work more extensively on their individual games by utilizing the full-service, full-swing practice facility. Additional amenities at Kiva Dunes include the clubhouse, fitness center and Kiva Beach Club. Call for tee times, specials and daily rates. Gulf Shores Golf Club was one of the first golf course built in Gulf Shores. In 2005, it was redesigned by Jay and Carter Morrish to lengthen the course and add numerous water features and bunkers. Don’t be surprised to see the courses atypical residents, like alligators and squirrels. 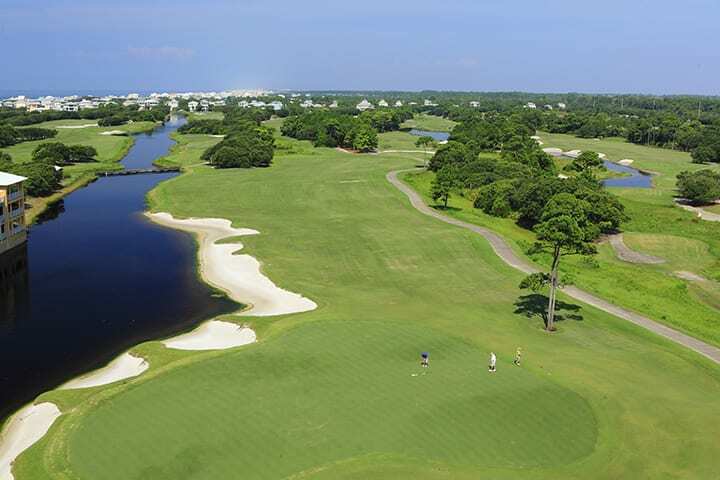 This 18 championship hole course is renowned by visitors and is a can’t miss for golf enthusiasts visiting Gulf Shores. Call ahead for tee times, rates, and specials. Just a short drive away in Foley, AL, Glenlakes Golf Club is a Bruce Devlin/Robert Von Hagge designed 18-hole course in Foley. Glenlakes has the feel of Scottish links golf featuring extra bunkering and postage-stamp sized greens. The 18-hole Vista-Dunes course is a links-style course, stretching 6,938 yards, and widely considered a challenging Gulf Coast course. The adjoining Lakes course is a nine-hole course that expands 3,065 yards and is great for golfers of all skill levels. For rates, tee times, and golf packages, call ahead. Although not located in Gulf Shores, Lost Key Golf Course deserves a mention as one of the Gulf Coast’s top courses. Lost Key Golf Course is nicknamed “Lost Ball” for the tightness of the course and number of balls lost to water features, wind gusts, and other natural vegetation. However, golfers who play a precision game will enjoy the challenge and beauty of the course. Redesigned by the Arnold Palmer Group in 2006, Lost Key was the first golf course in the State of Florida to be certified as an Audubon International Silver Signature Sanctuary. Fall is an especially great time of year for golf in Gulf Shores. The temperatures are a little cooler, the wind is a little breezier and the crowds are a little smaller. Book your golf getaway and relax at The Beach Club Resort & Spa this fall.